Apple strudel is associated with the Austrian cuisine, but has a long tradition in southern Germany as well. 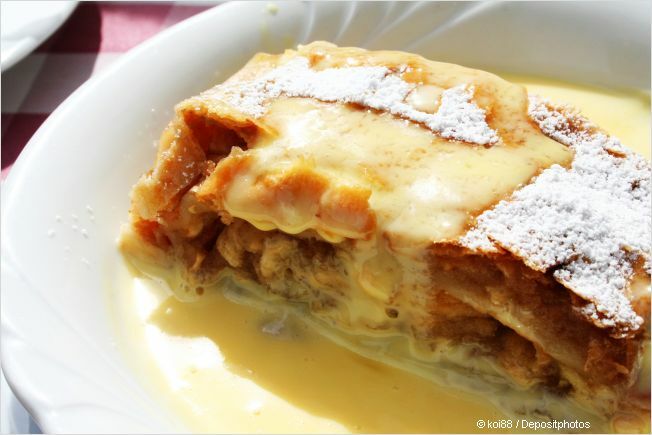 Apfelstrudel is one of the most enjoyed German desserts. It's not a treat that is prepared every weekend, it is reserved for special events. There are quite a few strudel variations known, Mohnstrudel (poppy seed), Quarkstrudel (curd) and nut strudel. However, the most popular is Apfelstrudel. The secret of a successful strudel is the dough. It must be elastic and smooth to stretch it very thin. According to an old saying one should be able to read a newspaper through strudel dough. Let's see how it goes. Making a great strudel dough requires some practise, so don't give up if your first Apfelstrudel doesn't look as good as in the photos. Use a kitchen scale for best results. If you use cups, please check this page for flour facts and gram to cup conversion. Sift flour into a mixing bowl, add butter or oil, salt and water. Knead the dough either with your hands, or a hand mixer (kneading hook) for 10 to 15 minutes until it is elastic and smooth. Warm a pan with hot water, oil the pan, and put the dough into the hot pan, cover, and let the dough rest at room temperature for 30 minutes. Prehead the oven (180° C / 350° F) and grease the baking sheet. Peel and core the apples and cut them into small pieces, add raisins, almonds, sugar, vanilla & lemon essences, and stir. After 30 minutes, roll out the dough on a large floured tea towel, brush it with a little butter, and then stretch the dough using your hands. 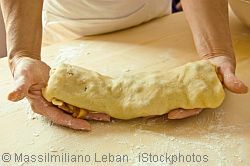 Place your hands under the dough to stretch it. Make a rectangle of about 70x50 cm (27 1/2 x 20 in). Brush the dough with 2/3 of the melted butter and sprinkle with breadcrumbs, leave an edge of 3 cm (1 1/4 in) uncovered. Spread the filling on the bread crumbs. Fold the uncovered edges of the short sides over the filling. With the help of the tea towel, roll the strudel, starting from the longer side, press the ends tighly. Put the strudel on the greased baking sheet and brush it with butter. Bake it for 50 minutes until golden brown. After about 30 minutes, brush the apple strudel with the rest of the melted butter. Remove the baking sheet from the oven, let the Apfelstrudel cool down a little on the sheet. Cover it with powder sugar. Serve the apple strudel hot or cold with vanilla sauce or ice cream. Guten Appetit.